What does isolation of the camera accomplish? Where are the gyroscopes hidden? 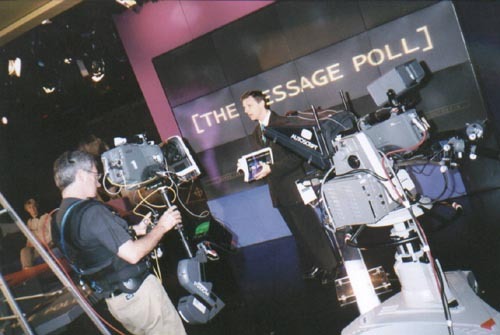 Can I use a prompter with a steadicam? So how do you control it now that you're isolated from it? No, really, where are the gyroscopes? What is the Steadicam well suited for? What is a Steadicam not well suited for? How much would it cost to hire a rig and operator? What other equipment might the operator have? What about low budget films and student work? Can I get a Steadicam for shooting video? Can I build a full-sized Steadicam? Do I need to be big and strong to become a Steadicam Op? What are some Good examples of Steadicam work? 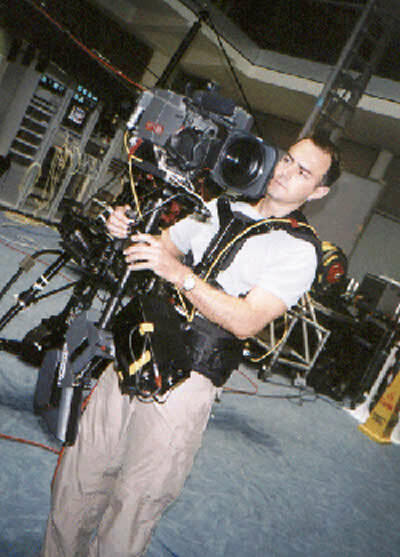 The Steadicam works in three ways: 1) it isolates the camera from all but the largest movements of the operator, 2) it spreads the mass of the camera to increase resistance to rotation, and 3) it brings the 'centre of gravity' outside of the camera to where the operator can manipulate it directly. Most hand-held shots suffer from a distinct jerkiness. This is because the camera is subject to all of the movements of the operator including the undesired shocks and bounces that accompany each footstep. In the human body, the muscles, joints, tendons and ligaments absorb a large portion of these shocks; what the body does not absorb, the muscles of the eyes and the image processing of the brain corrects for, turning a bumpy ride into a smooth flight. . These undesired shocks of walking consist of two elements: 1) quick movement of the entire camera by a small amount, and 2) rotation of the camera itself (tilt, pan, and roll). Successful isolation will significantly reduce the size of both types of movement and the Steadicam is designed and manufactured for successful isolation. This is the work of the 'Articulated Arm'. 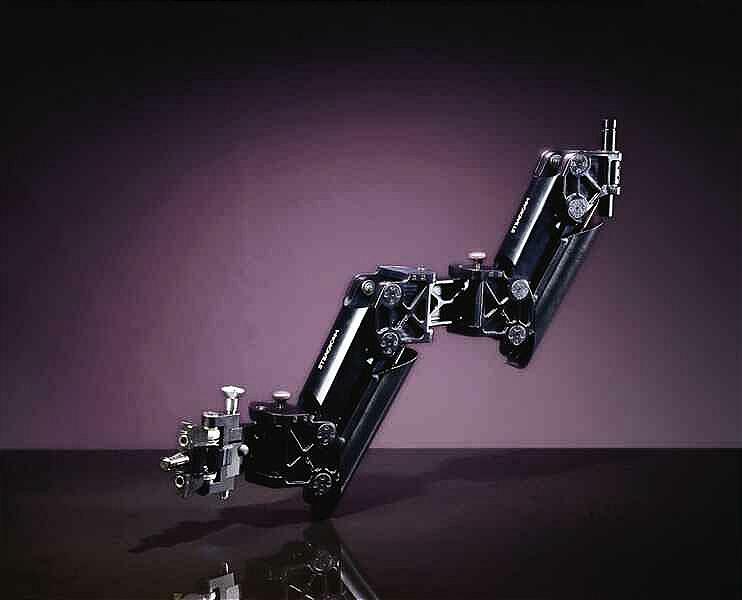 The articulating arm absorbs the up-and-down movements of the operator, taking advantage of the mass of the camera, as well as the mass of the 'sled', 'post' and 'gimbal' parts of the Steadicam. Each 'bone' (see picture above) consists of a sophisticated cable, pulley, and titanium spring shock absorption system. This shock absorption balances the tension in the arm, so that it takes as much effort for the operator to lower the rig as to raise it. The Articulated Arm absorbs the vertical shocks transmitted with each footstep. Under the weight of the camera/sled combination, the articulated arm averages out these shocks. Since each upward shock is matched by a downward shock, this averaging effectively nullifies the bounce of each footstep, isolating the camera from the Operator's footsteps. The key to this isolation is the mass of the camera/sled combination. This is where rigs capable of handling heavier cameras, like the 3A, the Ultra, and the PRO Sled have an advantage over rigs designed for lighter cameras, like the Flyer and, to a smaller degree, the EFP. The larger the mass of the camera/sled combination, the more resistant that combination is to movement; the more resistant the combination, the easier it is for the arm to average out larger shocks. This mass also resists side-to-side and front-to-back whole camera movement; however, without the added complication of gravity, the sturdy but free-moving hinges on the arm are all that's necessary to isolate the camera from the small side-to-side movements of walking. Imagine this: you're trying to launch a rocket at the moon, and it will only fly in the direction that its nose points, just like a camera will only shoot where its lens points. If you move it one hundred miles (ignoring the curvature of the earth) and point it at precisely the same angle, in the process using 100 gallons of gas, you'll still hit the moon. If, however, you use one-quarter gallon of gas to change the angle of the rocket by one degree, you'll miss the moon completely. This is why camera rotation, rather than whole-camera movement, is the primary enemy of stable images. It just takes a lot less energy to tilt, pan, or roll the camera than to displace the entire camera, yet a small change in camera angle has a much greater effect than even a big change in camera position. The Steadicam fights this rotational instability by increasing the cameras 'Moment of Intertia'. An object with a high Moment of Inertia is more resistant to rotation (nothing like a circular argument when discussing rotation). 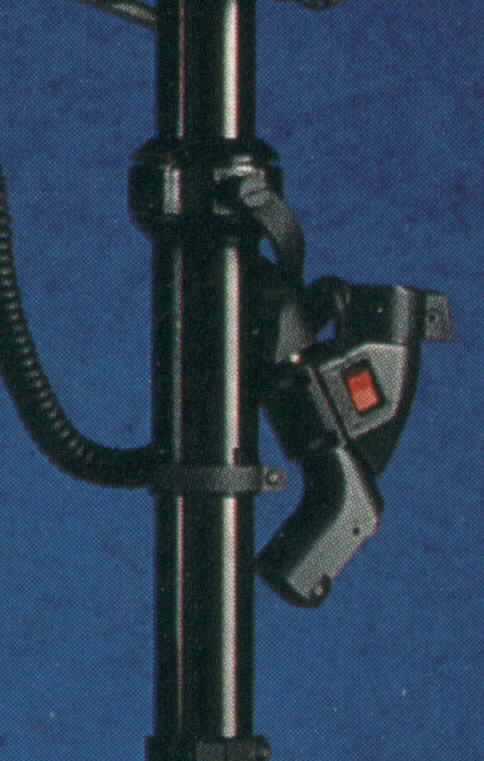 The camera is mounted on one end of the 'Post', and the battery and monitor (and whatever special electronics the operator has added) are mounted to the other end. This increases the Moment of Inertia. Now, the weight of the camera and the battery and monitor are located at a greater distance from the point around which the rig rotates -- the 'gimbal' see picture below. In conjunction with the increased moment of inertia, the Steadicam isolates the camera from rotation with its nearly frictionless gimbal (I've heard the Ultra Series operates with such apparent disregard for friction that it elicits gasps from members of the crew). Interestingly, the easier it is for the gimbal to rotate, the less likely the Steadicam itself will rotate. This is because the unwanted rotation travels up the articulated arm, rather than originating in the rig. The arm rotates relative to the rig. If there is significant friction in the gimbal, this friction acts as a rotational force; without significant friction, the rotational forces aren't transmitted, and the camera doesn't rotate unless the operator tells it to. When a force acts upon a body, it imparts an acceleration proportional to the force and inversely proportional to the mass of the body and in the direction of the force. Can I use a teleprompter with a Steadicam? Yes we use these all the time in television. We prefer the 8” LCD type (see picture). We have our own 8" LCD prompter which most clients are happy with. Many prompters are available with a radio link or we can supply a very fine coax cable. Power usually taken from the Steadicam rig. The big Steadicam secret: the job of the operator is not to remove instability; the operator's job is to shoot without adding any. What is the Centre of Gravity? There is one place on any object where you can push, pull, tug, yank, or throw it without adding rotation: its 'Centre of Gravity' (which I will be calling the 'Centre of Mass' throughout the rest of the document). A short ruler (say, 6 in. or 15 cm) illustrates the concept of Centre of Mass. If you attempt to push this ruler across your desk using just one finger at, say, the 1 inch or 2.5 cm mark, it rotates out from in front of your finger. If you attempt to push much closer to its centre of mass (the 3 in. or 7.5 cm mark), you can push it indefinitely across your desk with only slight adjustments along the way (The actual Centre of Mass is in the centre of ruler, where it would balance on a fingertip). The 'Centre of Mass' is the point at which an object is in balance in all three dimensions. In most cameras, this point is located deep inside the camera, where the operator cannot get within a few inches of it. Unable to reach the Centre of Mass, the operator has to control not only the image, but the operator's own added rotation -- which significantly increases instability. Again, there are no gyroscopes. Gyroscopes are massive objects, which take a great deal of energy to operate (more battery power means more weight), and which increase mechanical complexity. Part of the magic of the Steadicam is that it achieves its effects (except the external view screen) without added power -- just mass, balance and inertia. Shots over rough ground, particularly where one needs to look straight ahead or behind. Where one needs to continue on beyond the practical distance that can be accommodated with track. Where any other technique for moving the camera would be impractical for external reasons, such as the load-bearing abilities of the floor or the rigidity of a dock or bridge, etc. for any moving camera shot where the quality of the move contributes to the emotional qualities of the scene, such as the "hardness" of accelerations/decelerations, pans, etc., and the momentary control over the balanced/unbalanced nature of the composition as actors enter or are let out of the frame. Where one needs to isolate the camera from the movement of a vehicle (virtually any vehicle) for any reason, for instance: 1) where we wish to perceive the on-screen vehicle's motion within our frame, or 2) where we wish to negate the movement of our off-screen vehicle so it doesn't effect our shot of some other subject. For human or animal (or alien) points of view, that move through the world realistically, but don't shake unrealistically. For quick static shots with simple set ups, where time is a factor - such as during a sunset, or in the middle of a series of Steadicam shots, or when shooting VIP's on tight schedules where changing cameras and bringing in a dolly would be an unnecessary waster of effort. Where unpredictable events preclude marks -- like shooting dogs and kids and non-actors and rainbows! Static shots on long focal lengths.. although this can be a nice look for some. Video Tap -- for film cameras. This is essential. Because the monitor on every Steadicam is fed by a video signal, a film camera without a video tap means that the operator will have to shoot without an image, Bad Idea. Remote Focus/Genio (see Rate Card) Since touching the lens barrel would severely hamper the isolation of the rig, focus, if you want to control it, should only be done remotely. This will take a little longer to set up than a camera without; and, importantly, the focus puller should be someone familiar with remote focusing -- which is why most full-budget film shoots hire a Steadicam Assist with the Steadicam operator. Remote Iris or Zoom -- If you want to control either of these during a shot, say if the camera passes from inside to outside, than you will need the Iris as well. Generally, the same controller will run Focus, Iris, And zoom. Video Zoom Control, Bebob. Instead of controlling the zoom from external motors, like a remote focus, the Bebob uses the Lens's own power zoom, operating much like the controls in the lens hand-grip. If you think that control might be useful to your shoot, be sure to tell your Steadicam Operator the Make and Model of your video camera's zoom lens, so the operator can be sure to have the proper cables, if available. Even though an operator's day rate may exceed the budget of your production, if the project is well-planned and legitimate, there is a good chance you might find an operator to shoot it on a lower rate or equipment only basis. In fact, if your project offers a challenge that the operator would like to work on (i.e. it's film, and the operator usually works in video, or a shot that will look particularly good in the operator's reel), you may find the operator quite eager. One thing you must be sure of -- get the operator a copy of the final project on high-quality video the instant it's ready. Operators, especially the young ones most likely to volunteer, live and die by the demo reel, and your project's footage is going to be vital to that reel. Yes all Steadicams should work well with your video camcorder if it weighs enough. Even when flying film cameras, all Steadicams use a video reference, usually provided with a video tap or assist. A simple video out from the camcorder will work wonderfully. The biggest problem associated with using the Steadicam to shoot video is not the camera but the cables. Ideally, no cables should attach to the camera unless they end somewhere on the camera or rig. One _very_ thin cable leading from the rig will generally not interfere with the operator's work, although someone must work as a cable puller to keep that cable out from under everyone's feet. Large cables, like power cords and triax, can ruin a shot by negating the isolation of the Steadicam, making the shots unsteady and even "seasick." In all the setup for a video cameras on a Steadicam is often both easier and quicker than with a film camera, since there is no need for an additional video tap. There are many different models. 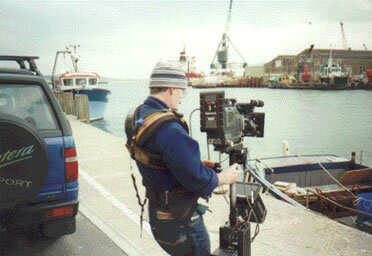 In general any TV camera that is designed for use on the operators shoulder can be carried on the rig. The biggest problem with TV cameras is that some of them can be too light and we sometimes have to add small weights to increase mass. This is the newest and most expensive model. It can fly 35mm cameras up to the Panavision gold, and even some 65mm cameras as well as all TV cameras. Arm, vest, and gimbal strength to handle cameras weighing up to 40 lbs. The smoothest Steadicam gimbal, exhibiting almost no friction. 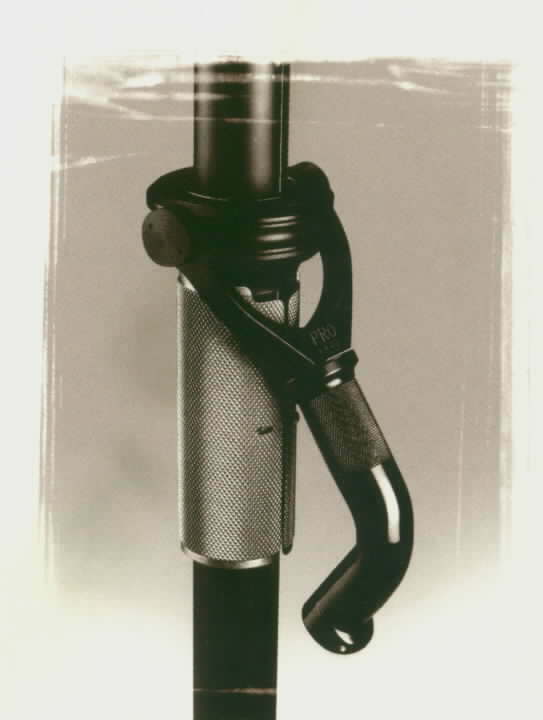 A significantly re-engineered articulated arm, for easier booming, and the ability to stay at the height the operator booms to, rather than returning to neutral. "No-tools" adjustments of the vest, arm, and sled. The other models require adjustments with hex- wrenches -- if they even offer adjustments. This has been the workhorse in the 35mm film industry for the last twenty years. The primary factor that makes the construction of a Steadicam expensive is the same factor that makes purchase of a Steadicam expensive: engineering. The Steadicam design is constrained most by one thing: the human body. All the weights, stresses, and forces must be within the comfort range of a human operator in good health. This means that many solutions available to ground- or vehicle-based rigs are just not applicable; to gain strength, for instance, you can't just add material to increase cross-sections. To increase inertia, you can't just add mass. Because of this, the biggest factor in determining the price of a rig is the weight of the camera that it can handle. Each element of the Steadicam has its own engineering challengers. The post must not flex, even at its full length; otherwise, quick starts and stops would be difficult to control. 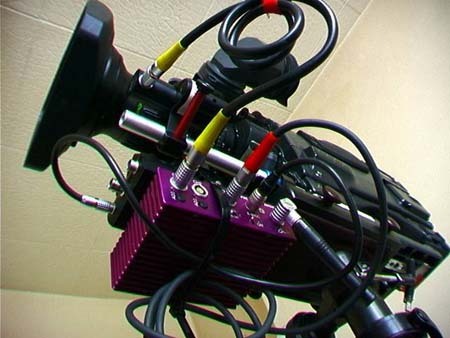 The camera mounting must be able to support the camera both upright, and when reversed in low mode, while being adjustable in both front to back and side to side directions to a fraction of a millimeter. The gimbal must be virtually without friction, must still rotate 360 degrees on three axes, and must be able to withstand the forces of a rig in motion. The vest should distribute the weight and the forces of a rig in motion, must be sturdy enough to rigidly hold the arm in its socket, and must be adjustable for a number of different body types. The most sophisticated engineering, however, is reserved for the Articulated Arm. This arm accounts for half of the cost of the rig. The arm must support the weight of the rig and camera at the approximate mid-point of its vertical travel. Under this tension, it is easy to move the arm and control the vertical position, because pushing down requires the same force as pulling up. (Two models make this even more challenging: the SK and the Master. With both models, the arm stays at the height the operator leaves it. With other models, the operator needs to keep pushing down or pulling up to hold the camera at any height other than neutral). To make the arm work, the Steadicams use a combination of pulleys, cables, and titanium springs (no other material is strong enough). Eventually, the economics add up: the amount of personal time, materials, and machine shop time will likely exceed the value of a Steadicam purchased new. And, while a Steadicam is not inexpensive by any means, its resale value means that the owner has a valuable, saleable asset. The resale value of a homemade camera stabilizer, however, approaches zero (and may even go negative!) the closer the design is to the Steadicam (or any other patented design). What does it take to become a Steadicam operator? Not necessarily. Strength -- and especially endurance -- will improve your performance as an operator; however, you don't need to be in the top 1% physical condition to be an operator. A camera operator's good eyesight. A working knowledge of the film and/or video industries. Having a blood relative who owns a major film or TV production company. Most operators need to do a special test which involves having your head examined ! The Steadicam has been in use since the mid-70's, with most of us being introduced to it in what was supposed to be a little film: a sleeper about a boxer in Philadelphia. The film was ~Rocky~, and the memorable Steadicam sequence followed Sylvester Stallone as he charged in triumph up the Philadelphia Courthouse steps. Since then, the Steadicam has been used in everything from music videos to amusement park rides. However, the most readily available Steadicam footage can be found in feature films. Two films that demonstrate well the Steadicam's abilities in skilled hands are: ~The Shining~, Steadicam by Garret Brown, and ~The Fugitive~, Steadicam by Steve St. John (Chicago) and Bob Ulland (North Carolina).Marathon Man, Casino, Goodfellas, The Fugitive, Much Ado. In my opinion some good TV steadicam would include ER, Sopranos, a lot of the sport coverage, soap operas,So Graham Norton. A lot of steadicam work in TV drama and entertainment goes unnoticed as it fits seamlessly into the production i.e. doesnt draw attention to itself. Even though ~The Shining~ was shot during the infancy of Steadicam technology, the Steadicam heavily influenced the production's feel, especially in exploring the huge, ominous spaces of the Overlook Hotel. - Following the Big Wheel. Little Danny (Danny Lloyd) kills time (not the last thing to get killed in the film) by riding his Big Wheel plastic tricycle through the lobby and Hallways of the Overlook Hotel. The camera follows Danny, as he rolls from the hardwood floor (very noisy) to carpeting (much quieter) back to hardwood. The combined effect -- the low camera angle, the alternate roar and silence of the tricycle's wheels, and the emptiness of the hotel -- all give a sense of something about to happen, and then Little Danny rounds a corner and finds... someone. - Jack (Jack Nicholson) and Wendy Torrence (Shelly Duvall) fight on a grand staircase. The camera looks over Wendy's shoulder at Jack (in one of those defining Jack Nicholson moments) as he follows her up the stairs. - Danny running from Jack through the hedge maze. At the end of the film, Jack has decided to kill his family. Danny tries to run away by going into the hedge maze on the Overlook Hotel grounds. As Danny runs, the camera follows him. In other shots, the camera leads Jack. In a few shots, the camera takes Jack's POV. One thing common among these shots is that the camera shows the floor or ground. With a dolly, looking ahead or behind would reveal the tracks, in sequences like the Big Wheel, would have required an incredible length of track. To illustrate the size and loneliness of the hotel, the camera often shoots from a great distance, including most of the room -- including the floor! -- in every shot. Throughout ~The Shining~, the Overlook Hotel gets most of the frame. ~The Fugitive~ is an excellent example of modern, non- intrusive Steadicam technique. No scene stands out as a Steadicam shot; the Steadicam shots blend smoothly with all of the tripod and dolly shots. Whether running through lobbies, walking through apartments, or charging through ballrooms, the characters are usually lead by the camera -- and that leading camera is the Steadicam. With the Steadicam, the actor can move freely in line with the camera (so that the camera sees their faces) without stepping on or over tracks. And the characters in this movie are almost always on the move.